Hollyleaf's guilt. Sad before she reveals her secret this is how i picture her.. Wallpaper and background images in the Warriors (Novel Series) club tagged: warriors cats jayfeather firestar lionblaze hollyleaf guilt. 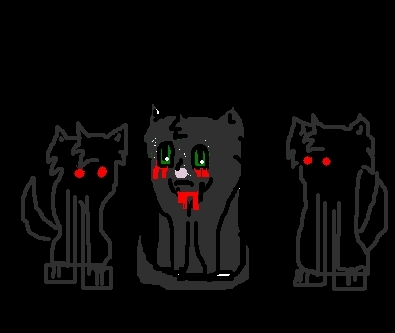 I hate ashfur not hollyleaf. Poor Ashfur? Are you crazy??? "all ashy wanted Squirrelflight to love him." After Squirrelflight chose Brambleclaw, Ashfur didn't over and move on like the strong warrior everyone thought him to be! When a fire consumed the camp, what did he do? He cried to Squirrelflight that it hurt him sooo much to see her choose Brambleclaw. Then he said that he would experience the same agony by watching her kits die in front of her. That's when Squirrelflight revealed the secret that they weren't hers because it was thee last hope to save them. Your innocent little Ashy was about to murder 4 of his Clanmates. He acted like a psychopath!!! Hollyleaf killed him or good reason. He should have died sooner. What would you do if you were Hollyleaf? I would have totally ripped his throat out and had fun with doing that, too! Anyway, innocent little Ashy isn't very innocent, is he? Holly is. She killed him. That brought justice. Well, more justice than there would have been if Ashfur didn't die.